Tanhok Ambassador mission chain up to the first big reward alrady known now! The mission chain stats at Tanhok Ambassador, that awaits us near 101 Supply Depot, in ARC Immigration - Tanhok. Just aside him, the merchant can show us what we can get as a reward... and its rly good unlimited BLP pistol, and a laser carabine! Stage 1: The Zeladoth Pandemic (part 1) 500 1600 12000 kill points, where Alpha with 500 hp give 3 points, so its 4000 mobs max 1.000.000 This stage allow us to pick which maturity we want to kill, thx to killpoint scoring system. We can kill Zeladoth from Alpha, to Kappa, with different point reward for kill. 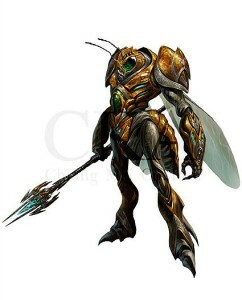 Stage 2: Squash the Invaders 1200 1200 1500 1.800.000 Second stage is about killing Merfolken Spearmen. Atm there is just one spot of them, where level 14 with 1000hp are the majority, cuz just only from time to time level 28 (with 1200 hp) spawns. Beware, cold dmg! Stage 3: The Zeladoth Pandemic (part 2) 1740 12240 10000 kill points 1.450.000 This is about killing Zeladoth Lambda - Omicron. Killpoint scoring system makes it interesting, but i assume most of us will deal with Lambda - Nu, but the math is for Lambdas. Stage 4: Right Outta the sky 250 350 2650 795.000 Sky Wraith - just 2650 kills no matter the maturity. Spots contain mostly young - matures, so the math will be for mixed spot too. the good part of this mission is the loot, which sometimes be a unlimited weapon! Stage 6: Into the Tamangon Fires 1750 1750 600 1.050.000 Golems x 600 ... heavy dmg here! Stage 11: The Senator Speaks! 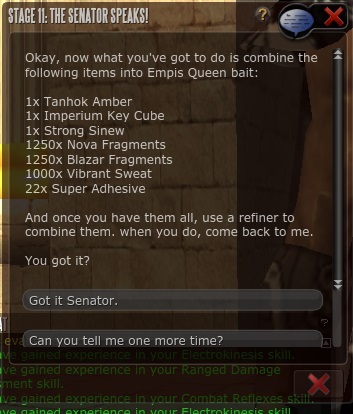 Senator asks us to make a Bait to summon and kill the Empis Queen here. The ingridients are named in mission dialog. After every stage we get a unique token. All 10 of them combined will give us Tanhok Token, that can be exchanged for cool rewards at NPC just aside the Tanhok Ambassador. Atm there is an unlimited BLP pistol (Ozpyn BP S1x4) and a laser carabine (Ozpyn HK S1X1). Is the Queen hard? What is she dropping? stages 8 and 9 added! After I start the chain a few weeks ago there was in stage 1 and 3 only 10k killpoints for complete the stage. Today I start stage 10 and all other data of this page are still correct. Yo, is this mission doable by the low/midlevel player? i afraid its a hard mission chain designed for mid-high level avatars (60-80 lev) or teams (40-60 lev). some of those mission stages are easy but some we were doing in team – the most dps member of it scores the kills, but its the only, or the easiest way i think for many players, including me. Sometimes just a fapper helping u will do. Zora epic chain is easier – most of the time solo 40-50 lev will be ok i think, in teams 30-40 lev maybe, but alot depands on items u use (good armor is essiential here if ur a lower level). I hope we will get an another mission chain for lower level solo players 20-30, but hard to say what the future will bring here. I added the Queen Bait recipe.